I have blogged before on Gubu World that if there is ever to be an Islamic reformation or a similar event that successfully brings Islamic values and democratic values into line with each other, Iran will be the country where this happens. I still believe this because Iran unlike other Middle Eastern nations is a politically vibrant country where intense debate on this issue exists. Iran has a strong civil society and a democratic tradition going back to the constitutional revolution of 1906 leading me to conclude that Iranians not only hold genuine democratic ambitions but that their society could handle the stress involved in a transition to democracy. That being said one should be under no illusion as to the true nature of the current regime. Many commentators on Iranian events, myself included are occasionally tempted to lessen the brutality of the regime because of the division of power that exists in the Islamic Republic which is so rare for a dictatorship. Make no mistake though, Iran is a class A dictatorship. During my time in Iran in 2004 I was exposed to the tremendous energy and enthusiasm of the "students for democratic change" movement. It was inspiring to be among them. However there was another more sinister side to this movement which I became regrettably familiar with. I am referring to the feeling that you are being watched. I was told by many Iranians that I shouldn't trust anyone. My immediate reaction in my naivety was "why, everybody is so nice". Iran is a country where people spy on each other. Many people who say they are hostile to the government may only be telling you what you want to hear. Just like behind the Iron Curtain people are always listening. Sometime its because an informer is secretly loyal to the regime. Other times its because the security services have gotten to a dissident and have threatened them and their family. Amazingly this even goes on outside Iran. Iranian embassies in Europe often threaten their compatriots with severe consequences for their incarcerated family member back in Iran unless they cease engaging in anti regime politics in their adopted country. It must be remembered that the Iranian regime is exceptionally clever. It is also worth noting that they themselves came to power in a popular uprising so they understand exactly what needs to be done to prevent one in the future. Below is a very disturbing clip from an Iranian television programme that encourages people to spy on each other. This does not happen in a quasi democracy. It only happens in a truly Orwellian state. We have seen plenty more Persian Pride this week despite the regime's efforts to crush the reform/revolutionary movement. Below is a powerful tribute to the demonstrators containing the most iconic images of the past two weeks where we have seen the best and worst of the Iranian nation. Iran is a wonderful country. Iranians are an amazing people. The events of the last twelve days have affected me deeply. To see a people who desperately want to live in a free country openly confront their oppressive rulers is truly inspiring. They say complaining about the government is a national past time in Ireland. That's true, and I'm as guilty as any but when you see young men and women being gunned down on the streets for daring to oppose their government, it really puts things in perspective. 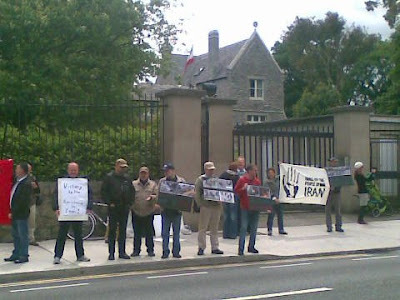 I attended a demonstration outside the Iranian embassy in Dublin on Saturday last. There is another happening outside the GPO on O'Connell street tomorrow. 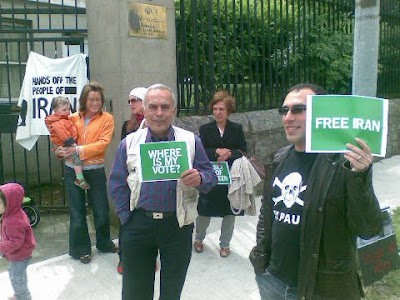 There is a big turn out expected from Ireland's Iranian community despite threats from the embassy that Iranians who get involved in anti regime activity could find themselves unable to return to the homeland or worse, it could be taken out on their relatives back home. What bastards. I for one, and my many Iranian friends plan on making a lot of noise. During my time in Dubai I made friends with lots of Iranians. In the summer of 2006 I flew to Germany for the world cup. Ireland had not qualified (thanks largely to the Israelis) so I was looking for another team to support. I chose Iran because, well I just love Iran. 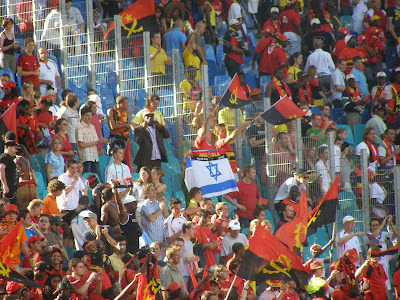 So along with some friends I headed for Leipzig to watch the Iranians take on Angola. Here are some interesting pictures I took. 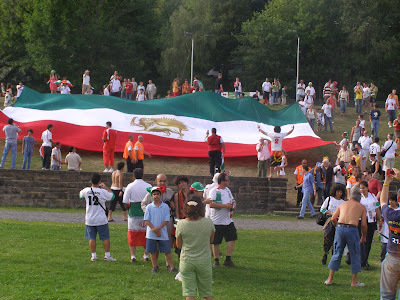 A group of Iranians unveiled this giant flag before the game. Note the symbol of the Lion with the sword in the middle. This is the pre 1979 flag as the symbol since the revolution contains the Islamic crest. Most fans had this flag indicating their opposition to the Islamic republic. I snapped one guy at the game with an Israeli flag. I wonder who he was supporting ? 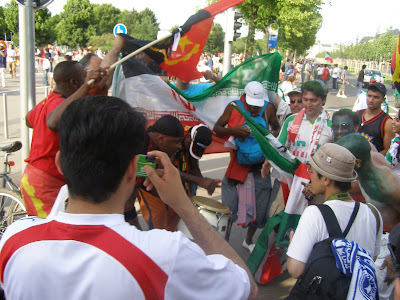 Iranian and Angolan fans celebrate a 1:1 draw outside the stadium. 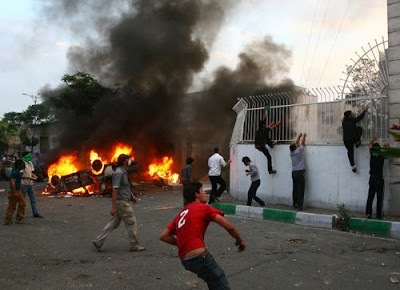 The Iranian authorities are admitting that ten people were killed and over 100 injured in Saturdays violence. It is safe to assume that the real toll is higher. Hundreds of prominent reformers have been arrested including the daughter of former President Rafsanjani. All foreign media, that had been forced off the streets into their hotels have now been banned from the country altogether. As international opinion really begins to come down hard on the regime they are beginning to look increasingly pathetic as they start trying to blame the unrest on the west. Its clear to me that anti American rhetoric is all they have. Its a card that they always play in order to throw sand in every ones eyes and confuse the issue. I for one am not confused. I know who is to blame and who the cruel ones are. There was another quite bizarre development that I want to mention. Saturday saw a suicide bomb at the site of Ayatollah Khomeini's tomb. Three people were injured by the blast. I was at this tomb in 2004 and I remember security being very tight. This perhaps explains why only the bomber was killed. I am very curious to know who carried out this attack. Although there are occasional bomb blasts in south west Iran where the disaffected Arab minority reside it is extremely rare for such things to happen in Tehran, and at such a revered site. It may have been the work of the MKO, who are basically the left overs of the Marxist wing of the 1979 revolution who were routed in the post revolutionary power struggle. I however thought that this group had no capability inside Iran having literally all been captured killed or exiled. The only thing I know for sure is that this suicide bombing introduces another unstable element into an increasingly unpredictable situation. 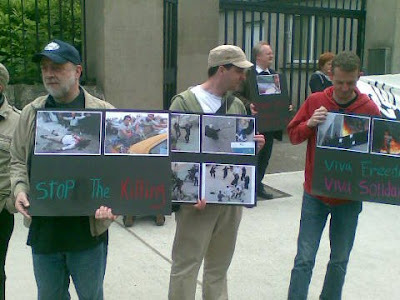 More photos of the Dublin demonstration organised by the "Hands off the People of Iran" organisation. As far as I can tell, all hell has broken out on the streets of Tehran. Khameini put it up to Mousavi and the protesters yesterday at Friday prayers and they both have responded with an emphatic "bring it on". The security forces tried to stop today's demonstrations from forming by blockading the city centre. As a result there was no centralized meeting place and sporadic clashes appear to have broken out throughout the city. People have been killed. There are even reports of tanks on the streets. I don't know how serious this is. I don't know if its the regime cracking down Tianeman style. But I refuse to believe that this is simply a power struggle within the leadership of the Islamic republic with the protesters being used as pawns as some analysts still maintain. This is not a conflict within the confines of the system. This is bigger. Tonight is pivotal. If too many die tonight it will be unstoppable. The bravery, passion and determination of the Iranians out on the streets tonight inspire and humble me. What a truly great people the Persians are. Below is the horrific moment a young woman is shot dead by Khameni's murderous gangs. Not for the faint hearted. 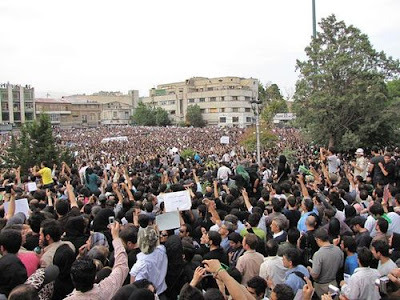 This was the scene at yesterdays demonstration in Tehran. 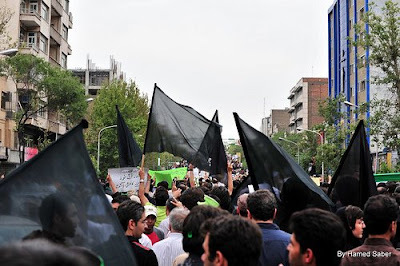 Demonstrators wore green to represent the colour of reform and black to mourn the seven demonstrators killed on Monday at the hands of the murderous Basij. It was dignified non violent protest. I gather it was bigger than Wednesdays but not as large as Mondays. The next big Demo is set for Saturday. I am curious to see how the demonstrators react to Khameini's outburst today at Friday prayers where he rejected claims of fraud in the election, blamed everything on the west and blamed the protesters for the blood spilt. Obama in his address to the Iranian people earlier this year. There is a debate raging in the US at the moment as to whether or not Obama's rather tame reaction to the Iranian crisis has been wise. Some believe he should have done similar to President Sarkozy who came out and declared last Friday's election a fraud. 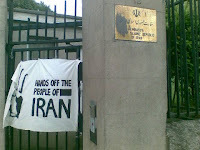 This led to protests outside the French embassy in Tehran and to the regimes favourite complaint of outside interference in Iran's internal affairs being directed at the French Ambassador as he was summoned to the Iranian foreign ministry. Astonishingly other conservatives appear indifferent to the events unfolding in Iran as they believe that it is insignificant whether Ahmadinejad or Mousavi become president as the US will still have to deal with the nuclear issue. My problem with this is they are ignoring what I believe is the very real possibility that this could develop into something bigger than a mere challenge to Ahmadinejad's leadership. It could in fact snowball into a revolution to topple the theocratic system. Thankfully Obama is not taking this approach either. To understand Obama's approach we first have to look at the nature of the Iranian regime. Anti Americanism is the oxygen with which the regime in Tehran needs to survive. Since 1979 this regime has sold itself on resisting western and particularly American attempts to use Iran to further Washington's interests. 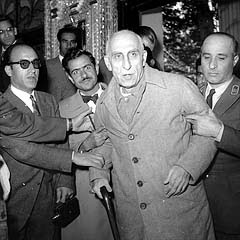 This stems back to the infamous Mossadeq incident in 1953 when MI5 and the CIA orchestrated the overthrow of the relatively popular leader Mohammed Mossadeq and installed the Shah of Iran who would go on to rule the country with an iron fist for a further 26 years. In my opinion though it is important to note that it was not so much the Shah's brutality that so infuriated Iranians. In truth, he was probably less brutal than the current regime. It was the fact that in the first place the Americans and the British felt perfectly entitled to infiltrate Iran and altar its politics to their advantage. Furthermore the Shah went on to rule as a blatant US puppet putting American interests before Iranian. For the proud Persian people this was really just too much. Still today, Iranians the world over whether they be dissident of loyalist, mullah or Marxist intensely resent how the west treated the great Persian nation as nothing more than a banana republic. There are of course some additional sticking points such as the fact that Saddam Hussein would never have been able to sustain the 8 year war with Iran had it not been for western support. Not to mention the Vincennes incident where a US warship accidentally shot down an Iranian passenger jet in 1989 killing all 290 on board for which the US has yet to offer a formal apology. The main point to remember however is the Mossadeq incident as since 1979 the Iranian regime have vowed to never again let the US decide Iran's future. The problem with that of course is that they have used this as an excuse to suppress every democracy movement that has raised its head in Iran for 30 years. And there have been plenty. Iran, unlike its Arab neighbours does have a tradition of democratic thought dating back to the 1906 constitutional revolution which almost succeeded in creating a working democratic system that divided the branches of power including Mosque and monarchy. Ironically an American named Howard Baskerville (pictured) was instrumental in the 1906 revolution and lost his life fighting against the royalists. Baskervile is historical hero in contemporary Iran and praised as a martyr. So as I described above anti Americanism is the Oxygen the Mullahs need and protecting Iran form outside meddling is what they claim to do best. Back in 2003 when students were still demonstrating on the streets in the final days of the reform movement the mullahs pointed West to the US invasion of Iraq and East to the occupation of Afghanistan as justification for a final crackdown. In addition throughout the remaining years of the Bush administration the former president publicly refused to rule out the use of covert operations to create instability in the Islamic republic. This played right into the hands of the hardliners. So this is why when Obama declared this week that "Iran's leaders should be decided by Iranians", it was the last thing the ruling elite wanted to hear. With his outstretched hand, his message to Iran on its national day, his admission that the United States had a hand in the 1953 coup in Tehran, Obama is slowly depriving the Mullahs of the Oxygen they so badly crave. Crucially, the President has not even made a judgement on the result of the election. As my good friend GW over at Wolf Howling described it so expertly, Obama is careful not to cross the Mossadeq line. The wait and see approach may prove more fruitful than anyone could have imagined. Earlier today Iran played South Korea in a crucial world cup qualifying match. Six of the starting eleven players wore green wrist bands in solidarity with the reformist demonstrators. However when they returned to the pitch after half time the wrist bands had been removed. God knows what was said to them in the dressing room. 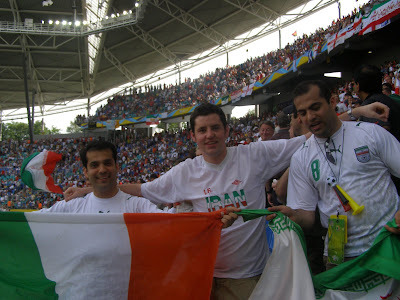 Irish fans may remember Ali Karimi (above right) who tormented the Irish defence back in 2001 when Ireland met Iran in a world cup play off. Its clear that the former Bayern Munich star is not a fan of the current regime. Watch the clip of the silent march of 100,000 protesters to the city centre. Mousavi urged his supporters to stay away from today's demo. But he has called on them to come out in force tomorrow. Can you imagine the size. I couldn't believe it when I saw this picture on the daily dish. This is Isfahan, probably the most beautiful city I have ever been to. Above is the enormous and spectacularly attractive Khomeini square, crammed with reformist protesters. I know for a fact that the trendy middle class from Northern Tehran who have been leading the protests in recent days often mock their compatriots in the city of Isfahan for being too old fashioned, conservative, religious and loyal to the regime. I didn't get that impression when I was there, and the above picture certainly challenges that stereotype. Keep it up Isfahan. No doubt this demonstration is connected to the violence inflicted on students in an Isfahan university student dormitory where at least one student was killed on Monday night. I will post details of that incident when I have more information. The Iranian state news agency have confirmed six more deaths last night in addition to the first fatality outside the Basij station yesterday. I am hearing from some blogs that it is much higher and includes a fatality in the ancient city of Shiraz. 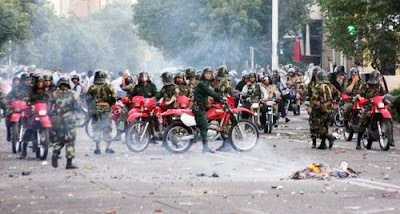 However there appears to be a general consensus that the 6 confirmed deaths happened in the one incident when Basij militia on motorbikes opened fire on a group of demonstrators that they had cornered. I have not yet confirmed the fatalities in Isfahan university. Isfahan is the most beautiful city I have ever been to. It aches me to think of wide spread violence on the streets there but when you think of the noble cause at stake, I think its worth it. Other rumors are flying about on twitter and other sites including the frightening scenario that Arabic speaking militia are operating throughout the city. If true this could only mean that the regime have drafted in Hezbollah fighters from Lebanon to help crush the demonstrations. I do not know how bad things really are but the video clip below of a dead youth being carried by demonstrators speaks for itself. The Basij respond by shooting this man dead. 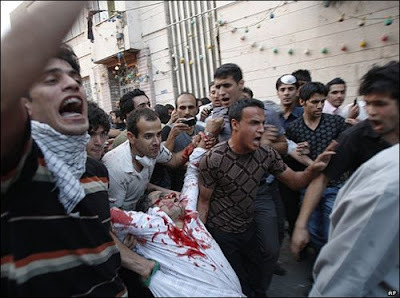 And in a repeat of the infamous 9th July massacre in Tehran university, which eerily enough is about to have its ten year anniversary, police stormed a student dorm in Isfahan university. There are unconfirmed reports of deaths. Below is Channel 4's description of the latest events where demonstrators attacked a base belonging to the detested Basij (government militia). The Basij responded with live ammunition killing one and injuring dozens. This is new. This is big. 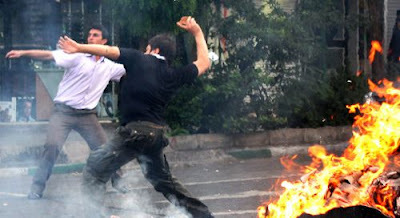 There has not been political violence in Iran like this since the post revolutionary power struggles of the early 80's. The demonstrations of 99 and 03 with which I am so familiar with never reached the level of intensity that we have seen today. How long will it last ? How violent will it get. These are the questions being asked around the world tonight. 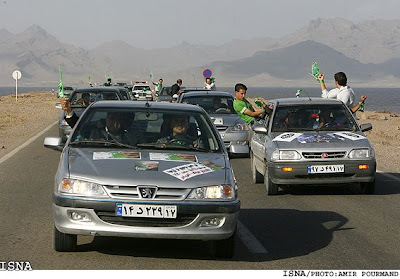 One great advantage that Iranians have now that they didn't have in 1999 or 2003 is the blogs. The politically vibrant youth of Iran, that I keep praising for their political awareness are compulsive bloggers. The blogosphere is safe, it cannot be infiltrated. Below are some more images of Persian pride as hundreds of thousands, perhaps millions of Iranians defy the government ban on the rally. This is the current scene in downtown Tehran as what appears to be hundreds of thousands, the daily dish is saying millions of proud Persians take to the streets to protest the result of Friday's bogey election. This is in spite of Iran's interior ministry ruling that the planned demonstration was illegal. 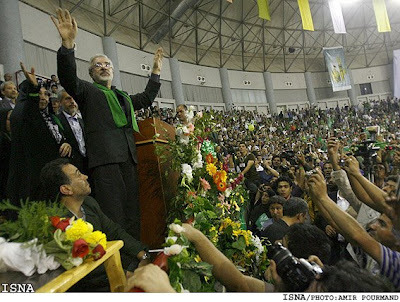 The rally is being adressed by Mousavi in his first public appearance since the election as well as former president Khatami and reformist cleric Ayatollah Saanei. This is extremely exciting stuff. I'm sitting here trying to type this but I can't sit still. I spent a month in Tehran in 2004 doing research for my thesis which was about the student protests of 1999 and 2003. I love Iran. I think its a wonderful country with a dynamic and vibrant people. I know how badly young Iranians want democracy and many of them are prepared to die for it. How serious is this ? Has a fuse been lit or will the demos die down. Right now its impossible to say. However, one of the problems with the 99 and 03 protests was infiltration. The government had many loyalist or people who owed the regime something informing of the student leaders. This was a major factor in the collapse of the student movement. However what we are seeing now appears less organised and more sporadic which may prove more difficult for the government to control. Something that is less predictable is always more difficult to manipulate. We have seen many times in history how a tiny spark can set a whole nation off. It certainly looks that way as so many thousands of different backgrounds, gender and age group continue to pour on to the streets with a level of boldness that nobody could have foreseen. I will continue to watch the fate of the great Persian nation unfold with optimistic anticipation. I will try to do two or three post a day as events unfold. I was in the process of getting out of my bed on Saturday morning when I heard the news on the radio that Ahmadinejad had won. I fell and almost had a re occurrence of my knee cap injury that's kept me off the football field for six weeks now. I was utterly stunned at the news. How could I and all the other commentators have gotten it so wrong. Elections in Iran are generally free and fair, that is of course after the grossly undemocratic vetting process. However it is quite possible that this entire election was rigged, so much so that Mousavi has taken the unprecedented step of calling on the council of guardians to annul the result. I heard on Friday night from the BBC's John Simpson's and Sky News' Tim Marshal that the mobile phone network was down in Tehran. Some Iranian blogs I was reading echoed this and expressed additional concerns that the establishment were making efforts to prevent Mousavi supporters from effectively mobilising. It is not a stretch to imagine that the regime would be willing to go one step further and rig the whole election. There was a massive 85% turn out in the election which should definitely have favoured Mousavi when you consider that the liberal youth of Iran make up 75% of the population. 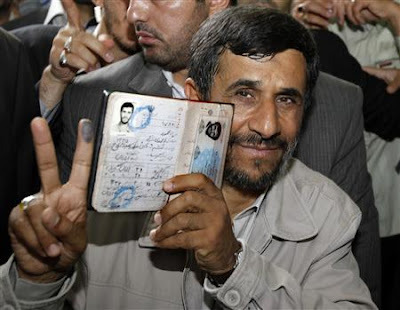 For Ahmadinejad to stroll to victory with a 62.63% to 33.75% majority is just too much for me and I for one am calling foul. 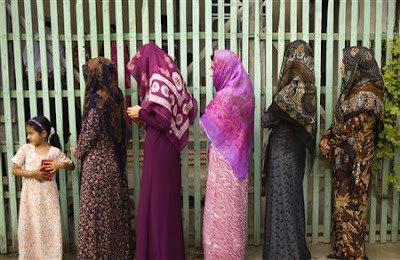 Women queuing for today's Presidential election. It was my experience in Iran that you could tell how radical a woman's politics was by the way she dressed. 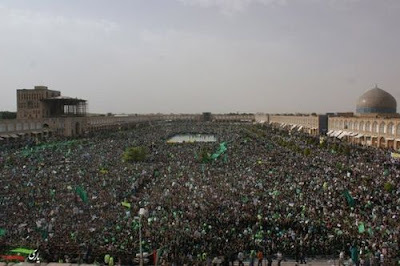 My guess is these are all voting for Mousavi. It appears there is a high turnout in today's elections in Iran. Some are predicting nearly 80%. This can only help the reformist Mousavi as it was the boycott by the progressive youth of the 2005 election that allowed the underdog and hard line Mahmoud Ahmadinejad to slip in the back door. Iran's young reformers have regretted this ever since. 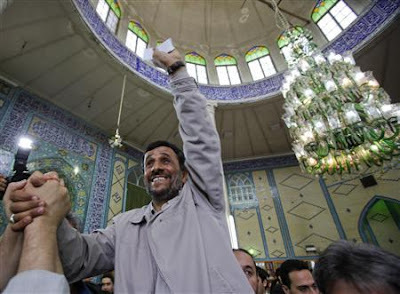 It was Mahmoud Ahmadinejad who as Tehran Mayor in the late 90's led the crackdown on the students marching throughout the capital in support of democracy. Once president he furthered his anti democratic agenda by closing countless pro reform newspapers and magazines. 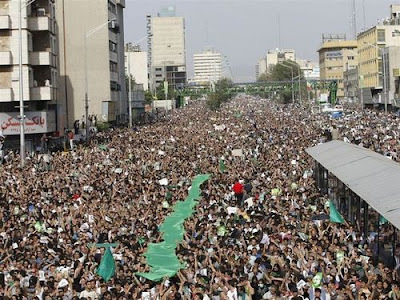 At this stage the main theme of the thousands of young Iranians parading throughout Tehran at this very moment is "anyone but Ahmadinejad". 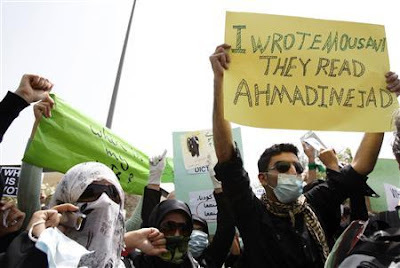 We will know soon enough if Ahmadinejad's popularity among the rural poor and working class of southern Tehran is enough to withstand the green revolution. 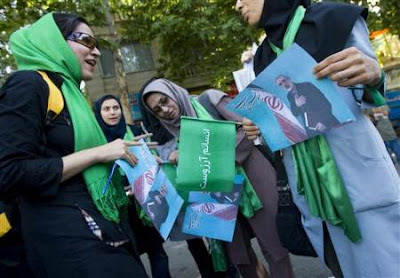 More trendy Iranians with the symbolic green color indicating their support for Mousavi. 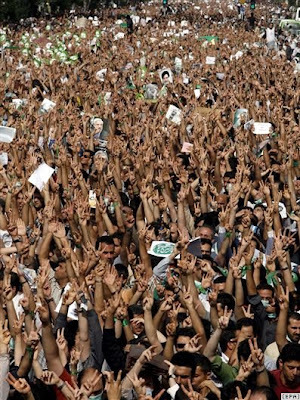 I am hearing on the Internet that a 3 kilometer long human chain of Mousavi supporters dressed in green is developing around Tehran city centre. According to Newsweek's Fareed Zakaria Iran is not a dictatorship. It doesn't want a nuclear bomb. 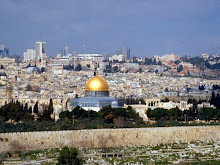 It wants to do a deal with the west and contrary to the American and Israeli right they are not suicidal. 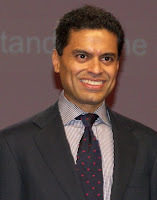 Zakaria argues that they are in fact rational actors that conduct foreign policy based on what they perceive as being in Iran's national interest. Does anybody care to disagree here ? Tomorrow the Iranian people will chose their next president. Most peoples immediate reaction is, "Iran has elections". Yes it does, and they are generally free and fair if you ignore the fact that certain people are banned from running. The catch is that the position of president is not the most powerful position in the state. It is probably the second or third most powerful post ahead of the supreme leader Ayatollah Ali Khameini and perhaps Ayatollah Ahmad Jannati who heads the powerful council of guardians. Having said that the President can influence the nation greatly in both international and domesticit issues and tomorrows election is a good indication of the mood the country is in. 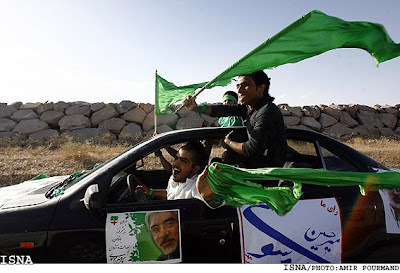 The main contenders are Mahmoud Ahdadinejad who is up for reelection and the reformer Mir-Hossein Mousavi who has created something of an Obama stlye revolution amongst Iran's politically vibrant and energetic youth. I can confirm from my time in Iran that the youth of the country are exceptionally well clued in to politics. The young and trendy in Iran love Mousavi. Whoever wins the youth vote wins the election as 75% of Iranians are under the age of thirty. 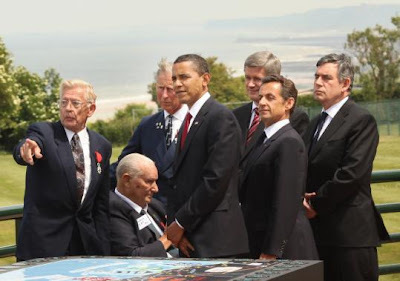 Prince Charles, President Obama, Canada's Stephen Harper, France's Nicolas Sarkozy, and Britain's Gordon Brown mingle with D-Day Veterans on Saturday June 6th. Last Saturday June 6th was the 65th anniversary of the allied landings in Normandy. As you know I was in Bulgaria last weekend and didn't have an opportunity to post on it. I want to do something now because I love history and have always been fascinated by World War Two in particular. Its a particularly poignant anniversary because 65 years is the last time we will see a significant number of veterans still around to attend the ceremony. Oh I'm sure at the 85th anniversary in twenty years time there will be some 103 year old timer who was 18 back in 1944, but as of today there are still many men left who fought on D-Day and in the Normandy campaign scattered throughout towns, cities and villages in the US, Britain, Canada and elsewhere. There are still plenty of grandfathers in peoples homes today who do not view these events in a historical fashion as I do. They view it as a personal chapter in their lives that they lived through. This will not be the case for long though as apparently World War Two veterans are dying at a rate of nearly 1000 a day in the US alone. Why was it so important ? I have asked myself this many times. Is it the symbolism of landing in western Europe after four years of Nazi occupation ? Or perhaps has its importance been overstated down the years as a way of highlighting the sacrifices of the western allies at the expense of the Russians. I believe the answer in both cases is no. In my opinion it really was all or nothing day and the only thing that was going to ensure victory was sheer blood and guts. When Germany conquered Europe and defeated or expelled all armies from the mainland it was clear that in order to retake the continent an invasion would have to be meticulously planned. Hitler's Atlantic wall was tested several times by raids most notably in August 1942 at Dieppe in Northern France where 6000 allied soldiers landed and attempted to hold the town. They were nearly all captured or killed. This disastrous raid confirmed how difficult it would be to successfully invade the Continent. So began the process of preparing for D-Day. There was the unprecedented build up of men and machinery in Britain, the intelligence gathering, the practise landings on English beaches, the espionage and even the endless weather forecasting. The tiniest error or oversight could have led to a catastrophic failure of the greatest seaborne invasion in history. As an example of the attention to detail that was required and the overall tension that existed at the time watch this clip from the surprisingly excellent low budget movie Countdown to D-Day starring Tom Seleck as General Eisenhower. What if it failed ? I have heard it said, "what if it failed, so what, the Nazis were on the run by then and they couldn't have turned the war around at that stage". I do not believe that this is true. The objective at this stage was not just beating the Germans, it was about beating them at quickly as possible. If the Nazis had successfully prolonged the war they may have been able to mass produce the V1 and V2 long range rockets as well as jet fighter and bomber aircraft all of which they were technologically ahead of the allies in. Had they done so these weapons would certainly have been capable of turning the war around. The truth is that if the Germans had of thwarted the invasion on the beaches in the early hours of June the 6th the entire invasion would have failed and the allies would have had to try again. The Germans would not of had to redeploy their forces throughout Europe weakening their position on the Eastern front in the process and they probably would have been able to contain the onslaught on the Red Army in the East. This could have prolonged the war in Europe until 1946 or 47 at which stage who knows what would have happened. Imagine the Nazis with cold war era weapons. It all boils down to one inescapable conclusion, June 6th 1944 was the single most crucial day of the 20th century. It was a unique moment in history when the fate of the civilised world boiled down to who fought hardest during a series of battles between 6am and midday on June 6th 1944. The men who fought in the slaughter of Omaha, Utah, Gold, Juno and sword beaches literally went through hell on earth so that future generations could live in a world free from Nazi tyranny. Family members of the Omagh bomb victims made legal history yesterday when they successfully sued those responsible for the atrocity. After the failure of the authorities north and south to convict anyone of a criminal offence for the massacre of 31 people in 1998 the family members decided to go it alone and take a civil case against the members of the Real IRA who were behind it. 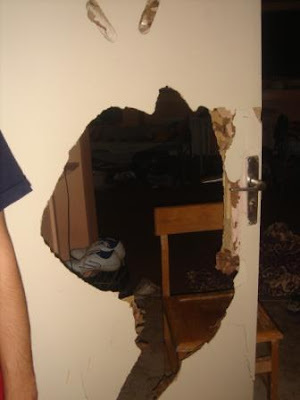 Four of the men thought responsible were sued for damages to the amount of £1.6 million. They will have to pay up or face prison. However as Michael Gallagher, whose 21 year old son was murdered that day, passionately explained outside the court in Belfast yesterday, this was never about money. It was about identifying publicly on the record that those four men are the ones who planted the bomb that day as a perverted way of expressing their opposition to the Good Friday Agreement. 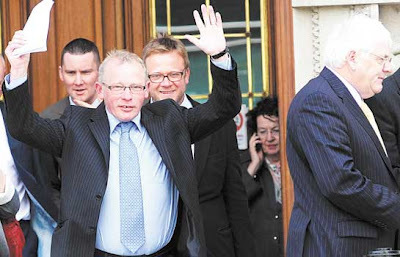 Family members of Omagh bomb victims celebrate the result out side the High court in Belfast yesterday. As I understand it, in a civil law suit such as this the verdict does not determine the guilt or innocence of the accused. However this ruling does identify those responsible for the bomb, largely thanks to evidence supplied by undercover FBI agent David Rupert who successfully infiltrated the Real IRA in the years after the bombing. Although the evidence supplied is not enough to allow for a criminal conviction it does find that these four men were liable for the attack. The burden of proof in a civil case comes down to the "balance of probabilities" as opposed to "beyond reasonable doubt" which is required in a criminal case. Because the burden of proof is much lower in a civil case it allowed the judge to find the defendants in the Real IRA liable for damages. I'm not quite sure how they pulled this off but suing a terrorist organisation, what a stroke of genius. There was a legal precedent set in Belfast yesterday. Who knows where it might lead. As the ferociously determined Michael Gallagher said yesterday, "we have sent out an important message to terrorists and their victims around the world - you now have a way of challenging those who've murdered your loved ones". Might we see Israeli victims of Hamas or hezbollah terrorism suing those organisations. Could this tactic be replicated throughout the world from Spain to Colombia ? At very least, it opens up the possibility. 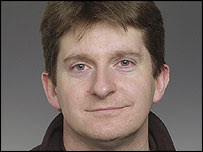 Last Saturday marked the fifth anniversary of the murder of Irish photo journalist Simon Cumbers (pictured) who was brutally gunned down by Al Quaeda while filming for the BBC in Riyadh. His British colleague Frank Gardner thankfully survived despite being shot six times. He is currently back working for the BBC as their security corespondent. All credit to him for not letting his injuries which have left him wheelchair bound end his career. I read Frank Gardner's fine book Blood and Sand which gives a chilling account of the killing. When the van with the gunmen pulled up to the two men the security personnel provided for Cumbers and Gardner immediately bolted. Simon and Frank then both ran in different directions. The exact moment of Simon's murder is not known exactly but because his body was found some distance from where Frank was shot it was thought he initially evaded his killers only to be cornered in a dead end street after unsuccessfully trying to get help from the locals. He was then murdered in cold blood. Simon Cumbers was a quiet unassuming family man who deserved better that to be hunted like an animal through the back alleys of Riyadh. According to the Saudi authorities all the gunmen involved in the shooting have been subsequently killed in various shootouts with the Saudi police. This incident is a powerful illustration of the Xenophobic and murderous nature of the Wahhabi sect of Islam practised by Al Quaeda and others in Saudi Arabia. 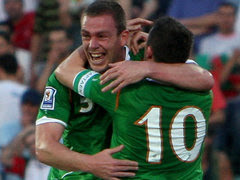 Richard Dunne celebrates putting Ireland in front in Sofia on Saturday night. The truth is I didn't go to any museums, synagogues or war memorials. I just got thrashed instead. In my defence we didn't arrive in Sofia until late Friday night after an all day stop over in Cologne where we, well, got thrashed. So after a super Friday night in Sofia's "Student City" district I was unable to rise earlier than midday the following day which pretty much ruled out any hope I had of doing some serious sight seeing. In all fairness, what did I ever really expect from a two day trip to eastern Europe with thousands of Irish fans for a crucial world cup qualifying match. Anyhow the main thing is we didn't lose the match and Ireland are still on course to finish second in the group behind Italy which would provide us with a realistic opportunity of making it to the world Cup in South Africa next year. Mind you the trip was not entirely without political exposure. 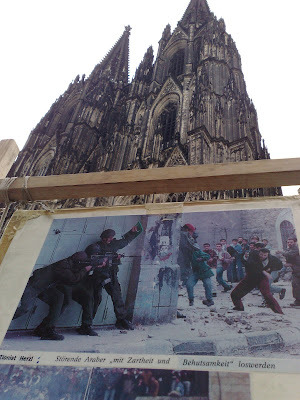 At the foot of the magnificent Cologne Cathedral, famous for surviving countless allied bombing raids during World War Two, we came across a pro Palestinian demonstration entitled "Cologne's wailing wall". Interesting choice of words I would say. My travelling companion and all round ballbreaker Mark May took this photo of "cologne's wailing wall" in front of the famous Cologne Cathedral. Gubu World is flying to Sofia tomorrow for Ireland's crucial world cup soccer qualifying match against Bulgaria. I have never been to Bulgaria and I just can't wait. I know its not a good time, what with Obama's speech in Cairo today, the upcoming 65th anniversary of the D-day landings and the Iranian presidential elections all deserving of my attention but I'm just a sucker for a good Irish international soccer match. I promise however that I will post on these topics next week. In the meantime you can expect a post over the weekend from Bulgaria updating you on what myself and my companions have been getting up to. I want to get to a few war memorials and museums. I also want to visit Sofia's synagogues. A surprising historical fact is that Bulgaria is one of only two European nations (the other being Denmark) that Israel and world Jewry regularly praise for their war time role in protecting their Jewish citizens. There were in fact very few Bulgarian Jews killed during World war two. That's it for now. I'm predicting a one nil Irish victory which would of course guarantee Ireland second place in the group and even put us in a brilliant position to top the table ahead of world champions Italy. In which case, South Africa 2010 would no longer be a dream. Barack Obama inspecting troops along side King Abdullah at King Khalid International Airport in Riyadh earlier today. President Obama arrived in Saudi Arabia today ahead of his much anticipated address to the Muslim world in Cairo tomorrow which I will post on separately. 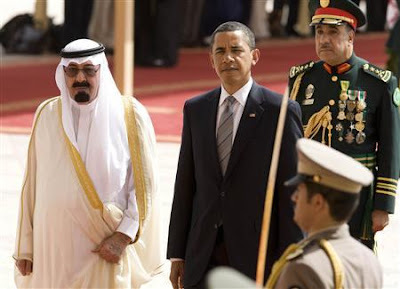 I expect Obama and King Abdullah have three contentious issues to discuss. 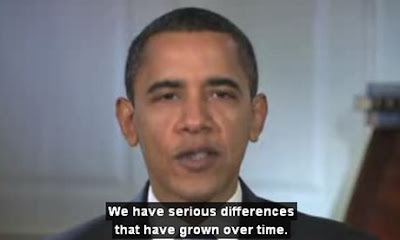 The first is Obamas domestic pledge to cut American reliance on foreign oil. Saudi Arabia is the worlds largest oil producer and the US is its biggest customer so naturally they will want to know how serious he is about his green revolution. Second on the agenda will no doubt be Iran. Saudi Arabia is the leader of the Sunni Arab World. It has always been opposed to Persian Shia Iran extending its influence into fellow Shiite Arab states like Iraq, Bahrain and the Lebanon. Therefor the Saudis see a nuclear Iran as a very real threat just as the United states and Israel does. The Saudis may in fact have a similar view to the American right and the Israelis that believe Obama's Iranian olive branch is deeply dangerous. In any case it will require some top class diplomacy from Obama to navigate through this thorny issue. The third issue will of course be the Israeli Palestinian peace process. I suspect, I hope that Obama is talking to King Abdullah about Saudi recognition of Israel as part of a region wide Arab Israeli peace process. This is something I believe Tony Blair, George Mitchell among others have been working to achieve behind the scenes in recent times. The thinking being that the Saudis could drag the entire Arab league along with a peace proposal that involved universal Arab recognition of Israel in exchange for a complete Israeli withdraw from the occupied territories as well as the dismantling of the most controversial Jewish settlements. Here's dreaming anyway. I rarely cover domestic Irish issues on Gubu World but I am going to make an exception with the Ryan report into Physical and sexual abuse of children in state run institutions. The story did make international headlines but not for long. In Ireland however this scandal is going to stay with us for a long long time. Below is a clip from current affairs programme Questions and Answers where last week an abuse victim confronted a government minister. This is truly harrowing and will no doubt go down as a piece of television history. Bad things happen in all countries. But in the good ones, the sandals come out and are dealt with. I am making this point because since this scandal erupted last week I have had one dominant thought. The image of gentle old Ireland is false. I am sick and tired of listening to older generations heap scorn on modern day Ireland. We may have conventional crime, teenage pregnancies and drug addiction but at least all of the problems we face today as a society are out in the open and we can attempt to deal with them. If you are a sexual predator in Ireland today, the place to be is in a dark alley way at three o clock in the morning. Back in the 50' and 60's the place to be was working in one of these industrial schools. I believe the former is a better state of affairs. Today you can protect your loved ones by saying, stay out of the ally ways in the early hours. But back in the "good old days" there was no method of protection for these children as the evil rapists were protected by the establishment. We may have organised crime today and people involved in it should be hunted mercilessly but I take some comfort from the fact that contemporary criminals operate outside the law. The organised criminals who raped and beat in Daingean, Artane and elsewhere were able to commit their crimes from within the system. This is a cause for national shame.